Hi, thanks for stopping in. That sound you here is a busy signal. I'm on the road again and have been pretty busy in June between preparing for this trip, writing three Restless Universe podcasts and trying to keep my grass mowed between all the rain showers! I'll be back to posting to the blog any day. I hope to have some interesting pieces about Charles Scovil, Director of the Stamford Observatory who I am staying with for a few days. I'm going to interview him about the history of the observatory and his role as director. Chaz is also a long time AAVSO member/observer/past president/recipient of the Director's Award, etc., etc. I plan to ask him about some of the colorful and amazing AAVSO people he's known over the last fifty years. 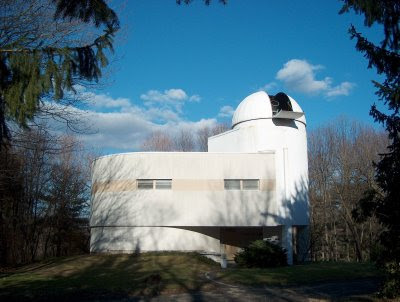 I'll be spending the rest of the week at AAVSO headquarters in Cambridge, MA. With any luck I'll have some interesting tidbits to share about that trip too. So stay with me. I haven't abandoned the blog. I'm just out gathering up some more material.